Last Wednesday I had dinner with two school friends Rob and Joel. Our six monthly catch ups had to be brought forward slightly this time to accommodate the impending fatherhood which is soon to bless both Rob and Joel (for the second time). 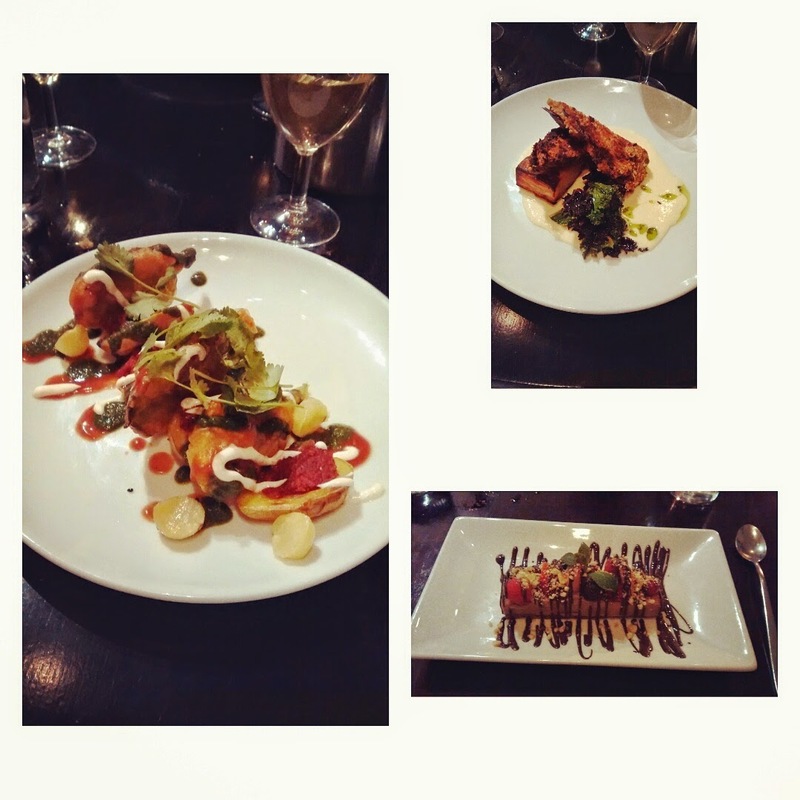 We take it in turn to pick restaurants and this time Joel nominated the The Gate vegetarian restaurant in Islington. My starter of potato chat (£6) was a level above the other two dishes I had on the night and was an early contender for one of the best things I'm likely to eat in 2015. The dish looked a picture (top left) and was a perfectly balanced blend of crispy spinach leaves and soft potatoes that were subtly spiced and have a lovely little sour tang from a tamarind dressing. Rob and Joel both had the three onion tart (£6) and were suffering food envy. The food envy was on the other foot when the main courses arrived. Joel and I both opted for the aubergine schnitzel (£14). It was a good dish, just not as exciting as my starter. One of my favourite elements of the dish was the small side of pan fried kale which provided a lovely contrast to the aubergine and potato gratin. The schnitzel was also a bit smaller than I'd expected after the generosity of the starter. Rob ordered the pan fried broccoli flower ravioli (£13). I didn't get to try the ravioli, but the presentation looked fantastic (similar to my chat) and apparently it tasted just as good too. For dessert I ordered the hazelnut chocolate semi fredo with autumn fruits and nuts (£7). It had the taste of nutella which was apt tribute to Michele Ferrero, the owner of nutella, who has recently passed away. The service was friendly, although it was sometimes a little difficult to attract their attention and if I was to go again in winter I'd request not to sit just inside the door which can be draughty. However, I'd happily go back for the chat, try the broccoli ravioli main and to find the star dessert. You can see all of the places I've eaten at in London on a handy little map here. Thanks dear for great sharing here. You know I also need to find a vegetarian San Francisco restaurants where I can have my favourite pan fried broccoli. I would like to have it with beer. Have you any recommendations for me?